Krishna also relates(3) that it was he, in a former incarnation, who communicated the indestructible yoga to an ancient illuminati, Vivasvat, who gave it to Manu, the great legislator. (4) He, in turn, instructed Ikshwaku, the father of India’s solar warrior dynasty. 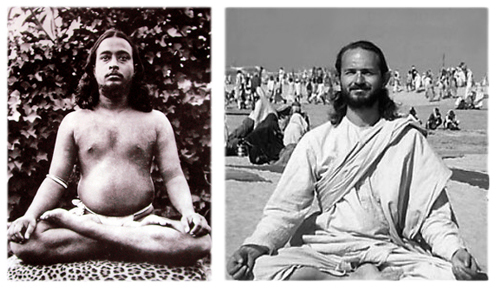 Passing thus from one to another, the royal yoga was guarded by the rishis until the coming of the materialistic ages. (5) Then, due to priestly secrecy and man’s indifference, the sacred knowledge gradually became inaccessible. Kriya Yoga is mentioned twice by the ancient sage Patanjali, foremost exponent of yoga, who wrote: “Kriya Yoga consists of body discipline, mental control, and meditating on Aum.”(6) Patanjali speaks of God as the actual Cosmic Sound of Aum heard in meditation. (7) Aum is the Creative Word,(8) the sound of the Vibratory Motor. Even the yoga-beginner soon inwardly hears the wondrous sound of Aum. Receiving this blissful spiritual encouragement, the devotee becomes assured that he is in actual touch with divine realms. 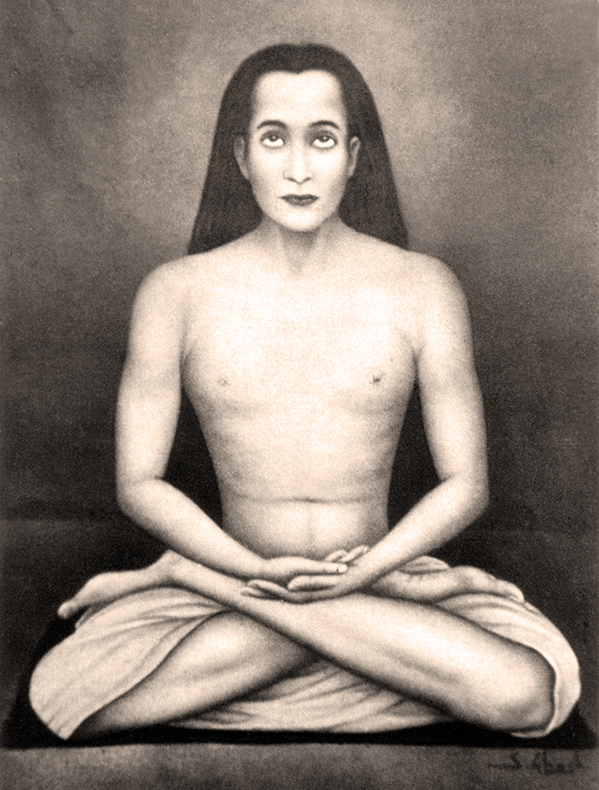 St. Paul knew Kriya Yoga, or a technique very similar to it, by which he could switch life currents to and from the senses. 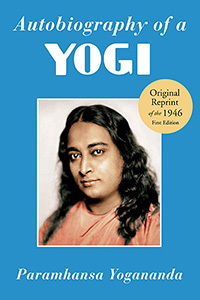 He was therefore able to say: “Verily, I protest by our rejoicing which I have in Christ, I die daily.”(10) By daily withdrawing his bodily life force, he united it by yoga union with the rejoicing (eternal bliss) of the Christ consciousness. In that felicitous state, he was consciously aware of being dead to the delusive sensory world of maya. The body of the average man is like a fifty-watt lamp, which cannot accommodate the billion watts of power roused by an excessive practice of Kriya. Through gradual and regular increase of the simple and “foolproof” methods of Kriya, man’s body becomes astrally transformed day by day, and is finally fitted to express the infinite potentials of cosmic energy—the first materially active expression of Spirit. The ancient yogic technique converts the breath into mind. By spiritual advancement, one is able to cognize the breath as an act of mind—a dream-breath. Many illustrations could be given of the mathematical relationship between man’s respiratory rate and the variations in his states of consciousness. A person whose attention is wholly engrossed, as in following some closely knit intellectual argument, or in attempting some delicate or difficult physical feat, automatically breathes very slowly. Fixity of attention depends on slow breathing; quick or uneven breaths are an inevitable accompaniment of harmful emotional states: fear, lust, anger. The restless monkey breathes at the rate of 32 times a minute, in contrast to man’s average of 18 times. The elephant, tortoise, snake and other animals noted for their longevity have a respiratory rate which is less than man’s. The tortoise, for instance, who may attain the age of 300 years,(12) breathes only 4 times per minute. By Kriya, the outgoing life force is not wasted and abused in the senses, but constrained to reunite with subtler spinal energies. By such reinforcement of life, the yogi’s body and brain cells are electrified with the spiritual elixir. Thus he removes himself from studied observance of natural laws, which can only take him—by circuitous means as given by proper food, sunlight, and harmonious thoughts—to a million-year Goal. It needs twelve years of normal healthful living to effect even slight perceptible change in brain structure, and a million solar returns are exacted to sufficiently refine the cerebral tenement for manifestation of cosmic consciousness. Gross man seldom or never realizes that his body is a kingdom, governed by Emperor Soul on the throne of the cranium, with subsidiary regents in the six spinal centers or spheres of consciousness. This theocracy extends over a throng of obedient subjects: twenty-seven thousand billion cells—endowed with a sure if automatic intelligence by which they perform all duties of bodily growths, transformations, and dissolutions—and fifty million substratal thoughts, emotions, and variations of alternating phases in man’s consciousness in an average life of sixty years. Any apparent insurrection of bodily or cerebral cells toward Emperor Soul, manifesting as disease or depression, is due to no disloyalty among the humble citizens, but to past or present misuse by man of his individuality or free will, given to him simultaneous with a soul, and revocable never. 8 “In the beginning was the Word, and the Word was with God, and the Word was God. . . . All things were made by him; and without him was not any thing made that was made.”–John 1:1-3. Aum (Om) of the Vedas became the sacred word Amin of the Moslems, Hum of the Tibetans, and Amen of the Christians (its meaning in Hebrew being sure, faithful). “These things saith the Amen, the faithful and true witness, the beginning of the creation of God.”–Revelations 3:14.